Chuck Palahniuk wrote, “The only reason why we ask other people how their weekend was is so we can tell them about our own weekend.” Why he was so cynical about a meaningful exchange of beautiful moments and memories, I’ll never know. I dipped on the King Eider drake that had been holding court around Irondequoit Bay but did muster a couple of Common Goldeneyes. Corey’s Best Bird of the Weekend was easy for him to pick despite the fact that he had over 100 species from which to choose. 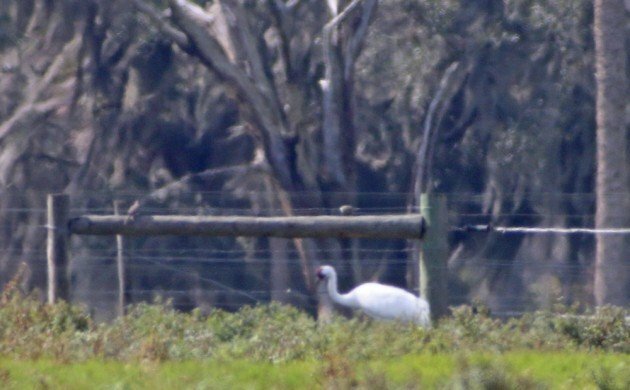 The Whooping Crane is a very special bird and seeing one for the first time is a never-to-be-forgotten experience. I think maybe my lifer Leaser Honeyguide. A flock of Skylarks on a snowy field near Heidelberg – both are a rare sight here in January. A lot of birds to choose from during guiding in foothill rainforests and near La Selva Biological Station. A few highlights were Ocellated Antbird, Blue and Gold Tanager, and White-crowned Manakin but the one that wins my best of the weekend was Chestnut-colored Woodpecker because we had a pair that did some ridiculous posing for photos about 10 feet in front of us. The gorgeous and timely Common Redpoll in Central Park was mine, without a doubt. Three male and one female Red-winged Blackbirds eating from a feeder outside a café here on the Olympic Peninsula. It was wonderful watching them two feet away through a window. I was surprised to see the three males taking turns so harmoniously. A tiny very yellow Weebill….yes, that is the name of a bird!